It’s been more than five years since the Branford Marsalis Quartet appeared in Kansas City or Lawrence. The embedded video features footage from a session for the 2012 release Four MFs Playin’ Tunes, the only studio album the group has released in the interim. The quartet will perform at the Lied Center on Wednesday, April 6. *KC Jazz Lark lambasts the flippant rejection of jazz in the press release that announces the end of the Jazz in the Woods festival and the debut of SoJo Summerfest. *Matt Otto’s new album Soliloquy is reviewed by a critic for KCUR. *Joe Klopus previewed Ernie Krivda’s performance at the Blue Room for The Kansas City Star. The Pitch also touts the gig. *Bobby Watson surveys Kansas City’s music scene in a trailer for a new documentary. *An Associated Press feature promotes the Blue Room. *Matt Hopper is part of a crowdfunding campaign to finance a trip to Brazil. *Tweet o’ the Week: Graveley Lab- Favorite new jazz album…Logan Richardson’s “Shift”. wicked good! *Comment o’ the Week: Anonymous- I presume the eight musicians split the door to make a whopping fifty bucks each. "Pro Musicians" should stop working for less than $100 per performance. Musicians accepting this INSULT for the last twenty years has lowered the bar for every player to come from now on. *From a press release: Congregation Beth Torah proudly announces a performance by Dan Thomas and some of KC’s finest jazz musicians featuring the music of Fiddler on the Roof. June 18th, 2016 at 7:30 pm… The performance will be held at Congregation Beth Torah, as a fundraiser for the Congregation… Tickets are available for patrons at $100/ticket, and general admission is $50/ticket. A solo by Charles Perkins over a bed of strings on Duke Ellington’s “Heaven” at the Westport CoffeeHouse on Thursday was one of the most divine things I’ve heard in recent months. The saxophonist's sublime effort was part of the second concert by Gerald Spaits’ Sax & Violins ensemble. The bassist’s group includes a string quartet, saxophonists Perkins and Rich Wheeler and drummer Brian Steever. My fear that the arrangements would favor treacly compromises was unwarranted. Nothing I heard during the 30 minutes I spent among the 40 people who paid a $10 cover charge was overly sentimental. A swinging solo by violinist Adam Galblum and a robust tandem statement from the saxophonists were among the other highlights. Sax & Violins has claimed a spot near the top of the list of my favorite bands in Kansas City. The late jazz critic and cantankerous cartoonist Harvey Pekar suggested that the tenor saxophonist Ernie Krivda languishes in relative obscurity only because he opted to live in Cleveland. Jazz aficionados in Kansas City can gauge Krivda’s worth for themselves during his rare area appearance at the Blue Room on Friday, April 1. *Monique Gabrielle Salazar reviewed the Kansas City Jazz Orchestra’s Rhapsody for KCUR. *Nonesuch Records will release two Pat Metheny albums on May 6. *The Pitch touts Stan Kessler’s Force Five. *Charlie Parker will be inducted into the Apollo Walk of Fame on March 30. *Robert Trussell interviewed the American Jazz Museum's Cheptoo Kositany-Buckner. *Patti Austin’s concert at the Gem Theater was reviewed by The Kansas City Star. *The documentary "Vince Giordano- There's a Future in the Past" will be shown at 7:25 p.m. Thursday, April 14, at the Cinemark Palace at the Country Club Plaza as part of the Kansas City FilmFest. The New York based bandleader and the film’s co-director Amber Edwards will participate in a question-and-answer session after the screening. *Tweet o’ the Week: Jack- @SoJo_Summerfest Not sure why you felt the need to mess with something that worked. Always looked forward to the national jazz acts. *From Brandon Draper: Brandon Draper returns to the Blue Room in Kansas City with an all-star lineup featuring his father a renowned Hammond B3 blues artist. April 9, 2016 7pm doors / sets 8:30pm – 12:30am. Brandon Draper: drums, percussion, guitar; Paul Draper: Hammond B3, vocals; Hermon Mehari: trumpet; Brian Scarborough: trombone; Rich Wheeler: tenor saxophone; John Kizilarmut: vibraphone, drums, percussion; Ben Leifer: bass. Set 1- Brandon Draper original jazz, Set 2- Paul Draper original blues/funk/jazz, Set 3- Jazz/Funk/Blues/Boogaloo Traditions. *From Stan Kessler: The Sons of Brasil 25 Year Anniversary Celebration! It's our silver anniversary. We've been playing regularly For a quarter of a century. Unbelievable. The celebration begins the following dates and will continue throughout the summer until we're sick of it. April 2, The Art Factory, 7-9:30. April 15, The Blue Room, 8:30-12:30. There will be SOB trivia contests with prizes for the winners. Personnel: Stanton Kessler-Trp./Flugel, Danny Embrey-Gtr., Roger Wilder-Piano, Greg Whitfield-Bass, Doug Auwarter-Drums, Gary Helm-Perc. *From Blue Note Records: Following the February 26 release of Shift, Logan Richardson’s assured Blue Note debut, the alto saxophonist has announced May U.S. tour dates in New York, Los Angeles, Boston, and his hometown of Kansas City (May 23 at the Blue Room)… Richardson’s touring band will feature Mike Moreno on guitar and Sam Harris on piano. 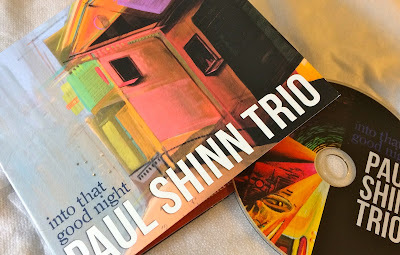 The Paul Shinn Trio is the most thoroughly documented ensemble associated with Kansas City’s jazz scene. Into That Good Night is the group’s third studio album in less than three years. The trio of pianist Paul Shinn, bassist Dominique Sanders and drummer Ryan Lee is entirely worthy of the distinction. The mainstream jazz created by the three young men has evolved from exceptional precociousness to borderline greatness. Exposed to Into That Good Night in a blindfold test, most listeners would guess that the trio has a cumulative age of more than 150 rather than less than 90. An emphasis on melody- a quality often dismissed by youthful jazz musicians- distinguishes the project from the relentless deluge of piano trio albums. Shinn’s solo reading of Robert Schumann’s “Träumerei” sets the tone. The trio reclaims the quaint Victor Schertzinger and Johnny Mercer standard “Not Mine.” The dignified “Too Late” is a contrafact of Charlie Parker’s “Confirmation.” Shinn originals including the title selection echo the George Gershwin songbook. A couple tracks offer a break from the elegant swing selections. Percussionist Patrick Alonzo Conway adds Latin textures to the lively “Re-Beginning.” The brief “Until It’s Right” contains diverting sound manipulations. Shinn is a polished pianist and the tandem of Sanders and Lee strikes the proper balance between exciting aggressiveness and tasteful reserve. A fourth album by the trio in the coming months would be entirely welcome. The Minneapolis based pianist Laura Caviani performs Friday, March 18, at the Art Factory and Saturday, March 19, at the Blue Room. She interprets Mary Lou Williams’ “Why” in the embedded clip. *Gale Tallis, the executive director of the concert hall, recently announced that the next season of the Folly Theater's jazz series will include concerts by Cecile McLorin-Savant and the Donny McCaslin Quartet. *The Pitch touts Saturday’s Patti Austin concert. *Eddie Moore and the Outer Circle and the Project H are playing at a day party hosted by Nextbop in Austin this week. *Chris Burnett filmed a conversation with Marcus Hampton. *Brett Jackson was interviewed by Joe Dimino. *Chris Burnett reports that the Italian pianist Dino Massa will perform in the area next month. *Tweet o’ the Week: John Levenstein- @realDonaldTrump You should also consider bringing up Kansas City jazz legend Count Basie. Something about jazz now being made in China? *From Ron Carlson: After a hiatus from Live Jazz Fridays at the Lucky Brewgrille at 5401 Johnson Drive in Mission KS, we are now ready to schedule Live Jazz Thursdays there in April from 6 - 8 pm. I am looking forward to this chance to play there with great players on a quieter night. In the meantime, I am spending a good bit of time scheduling and periodically performing at The Art Factory near 135th and Nall Ave in Overland Park KS. This is the best new venue in that part of town since Take Five. Upcoming players schedule there include Bob Bowman, Stan Kessler, Matt Otto, Todd Strait, Laura Caviani and many others. We are even working on scheduling big bands for the room. *From Michael Shults: Really happy to be bringing pianist Phil DeGreg back to KC next week. Phil was one of my teachers in graduate school at Cincinnati Conservatory and is really one of the best I've ever heard. He has an amazing story - studied psychology at Yale but caught the music bug while in college, moved to KC in the 80's and got it together in a hurry. Essentially went from a novice to touring with Woody Herman in a few short years. I wrote about him for allaboutjazz.com in 2011. We are playing two shows next week - Tuesday (March 22) at the Majestic, and Wednesday (March 23) at Green Lady with New Jazz Order. The scenes that depict a protagonist’s initial grappling with his or her newfound powers are my favorite parts of many superhero movies. Alicia Olatuja’s superpower is her astonishingly beautiful, flexible and powerful voice. An audience of more than 300 watched her attempt to find the most advantageous applications of her wonderful instrument at the Folly Theater on Friday. The young artist from St. Louis sometimes seemed to be tentatively trying cabaret, R&B, pop, jazz and gospel on for size during her appearance as the Spotlight Artist in the Folly’s venerable Jazz Series. There’s no reason Olatuja can’t eventually master all of those forms, but Friday’s concert was hampered by stylistic inconsistencies. Olatuja was a world-beater on familiar material like a rapturous version of “Amazing Grace” and a silky reading of the Michael Jackson hit “Human Nature.” Her version of Djavan”’s “Serrado” was also exquisite. Several of the less successful selections constricted Olatuja’s voice and the talents of an outstanding four-piece band that included additional vocalist Rasul A-Salaam and pianist Jon Cowherd. I was tempted to jump out of my seat every time she dipped into her lower register or hit a high note that seemed capable of shattering glass, but Olatuja usually opted for tasteful restraint. She’s the rare vocalist who might benefit from being more ostentatious. Discussions about jazz are often muddled by semantics. I’ve learned the hard way that when some people insist that they love jazz they really mean that they fondly recall big band hits by the likes of Glenn Miller. The music and dance production In the Mood was made with them in mind. The traveling show will delight nostalgic audiences at Helzberg Hall on Wednesday, March 16, and Thursday, March 17. *Eddie Moore was awarded an unrestricted $10,000 cash grant from the Charlotte Street Foundation. *Soliloquy, a new album by a group led by Matt Otto, was released this week. *Representatives of the American Jazz Museum were interviewed by a television reporter. *Marcus Lewis was interviewed by Joe Dimino. *The Pitch recommends Bram Wijnands’ weekend residency at the Majestic. *Chris Burnett made a presentation at the Self-Employment in the Arts Lecture Series at Drury University. *Cheptoo Kositany-Buckner of the American Jazz Museum shared her vision for the institution with KMBZ. *Peter Schlamb's Electric Tinks was featured on KCUR’s Local Listen segment last week. I vowed that I’d never return to Prairiefire after my first trip to the Overland Park development in 2014. Parking challenges and breathtaking prices at a movie theater convinced me that I just didn’t belong at the popular shopping and entertainment district in Overland Park. Jazz will make a guy do funny things. I returned to Prairiefire on Friday to catch the Alyssa Murray Trio at the Art Factory. A friendly dog greeted me at the threshold of the venue. A woman who collected the $5 cover charge was equally welcoming. The low-key ambiance in the small performance space was worlds removed from the glitzy bustle on the sidewalk. About two dozen people sipped adult beverages as Murray’s band performed a blend of winning original material and astute covers by the likes of Chick Corea and Fiona Apple. The Art Factory may not entirely fill the void created by the closure of the sorely missed Johnson County venue Take Five Coffee + Bar, but it’s an attractive space with an increasingly ambitious jazz calendar. My embargo of Prairiefire has been lifted. The promotional material for Alicia Olatuja's concert at the Folly Theater on Friday, March 11, compares the vocalist to the pop stars Beyonce, Jennifer Hudson, Kelly Clarkson and Alicia Keys. That's fair, but the artist from St. Louis also sounds as if she's familiar with the work of Sarah Vaughan, Gal Costa and Cassandra Wilson. Olatuja will be accompanied by vocalist Rasul A' Salaam, pianist Jon Cowherd, bassist Ben Williams (I can't verify that it's "the" Ben Williams) and drummer John Davis. *KCUR published a review of Logan Richardson’s Shift. *Anthony Rodgers reviewed a concert by the Kansas City Jazz Orchestra. *The Pitch recommends a performance by a band led by Matt Otto. *Dominique Sanders is among Joe Dimino’s recent interviews. *Donny McCaslin will perform at the 2016 edition of the Charlie Parker Jazz Festival in New York. *Comment o’ the Week: Anonymous- Man. That Western Auto sign has seen better days! *From the Mutual Musicians Foundation: The Mutual Musicians Foundation will be celebrating their Founding Day, along with the American Federation of Musicians national office members, local union representatives, community neighborhood organizations and special guest, Sally Liuzzo, daughter of slain Civil Rights martyr Viola Liuzzo, Wednesday, March 2, 2016. “We are in our 99th year and have begun a series of events that will lead up to our centennial celebration. The date of the founding of Local 627(March 2, 1917) is a definitive time in global arts history and many are gathering with us to recognize our significance to that history.” Said Anita J. Dixon, Executive Director. The following events are scheduled: Press Conference to announce activities to the Centennial, unveiling KOJH radio station plans and the MMF’s renovated facade, Historic signing of petition for local 34/627. *From a press release: The University of Kansas School of Music proudly presents the 39th Annual KU Jazz Festival concerts at 7:30 p.m. on Friday, March 4 and Saturday, March 5 in Woodruff Auditorium at the Kansas Union. This year’s concerts feature special guest artists Walter Smith III, saxophone (March 4) and drummer Matt Wilson (March 5). Both concert events are open to the public… Tickets for each concert are $15 for adults, $10 for seniors, and $10 with a KU ID... Following the main stage concerts at Woodruff Auditorium in the Kansas Union, the music will continue with the KU Jazz Festival After Hours Jazz Sessions, held at the All Seasons Den at The Oread (1200 Oread Avenue, Lawrence, KS), from 10:00 p.m. to 12:30 a.m. both evenings. These jazz sessions will feature performances by the Matt Otto Quintet with special guest Dave Scott, trumpet.